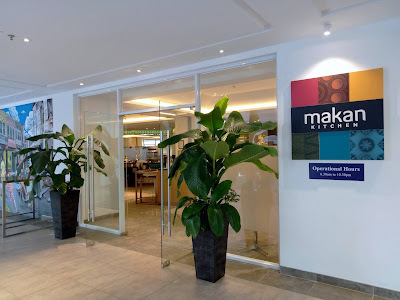 Makan Kitchen is the main restaurant of DoubleTree Resort Penang. Located at Level LG of the 4-star hotel, Makan Kitchen serves a variety of local dishes as well as international flavors. 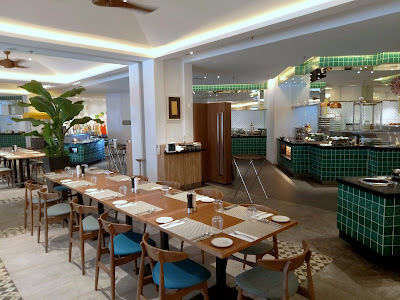 This eatery also provides breakfast for the hotel's in-house guests. 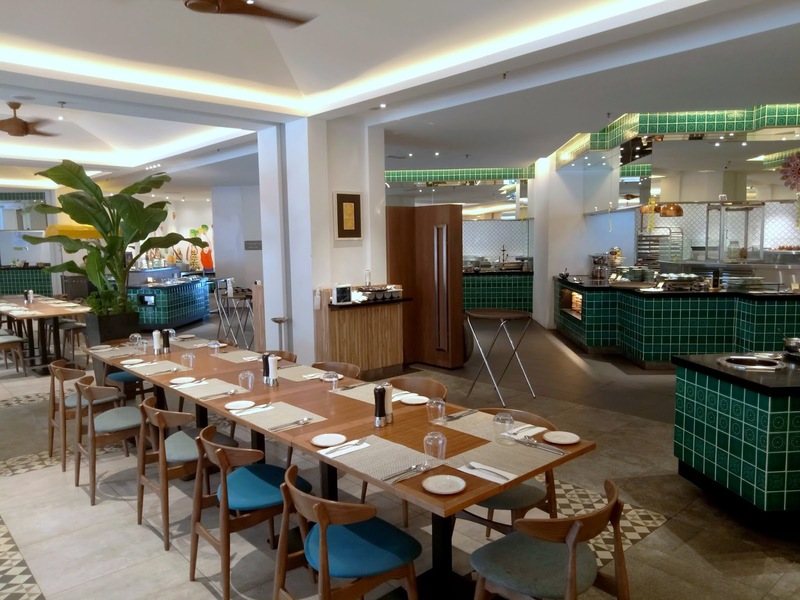 The dining section of Makan Kitchen is reminiscent of a local hawker center. Tiffin carriers decorate many tiled food counters to create a nostalgic feeling. Meanwhile, the open kitchen on the side is where à la minute dishes are prepared. 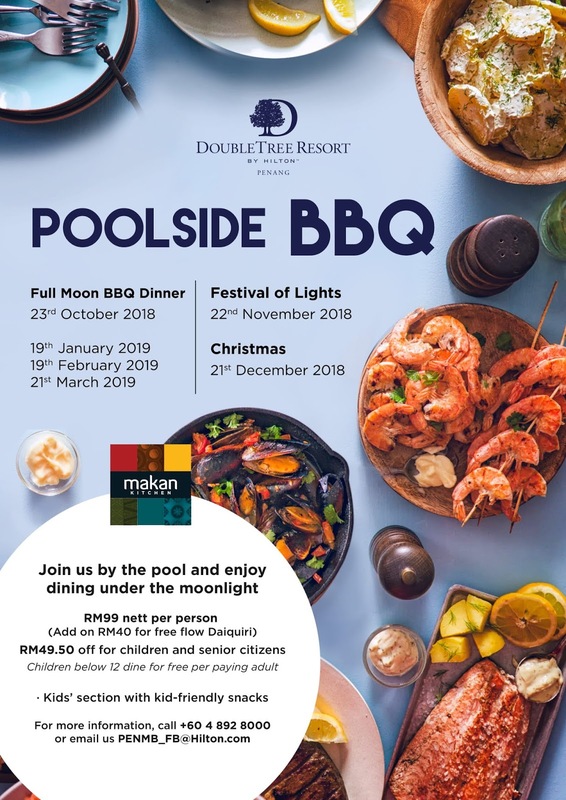 For 6 months between October 2018 and March 2019, Makan Kitchen offers the Poolside BBQ Buffet every full moon. This month, full moon falls on November 22nd. 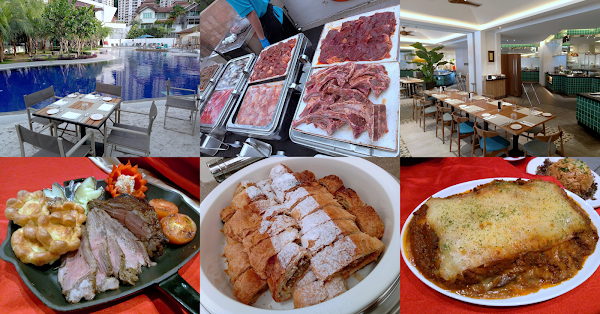 As to the reason behind having the buffet during full moon, I speculate this is because the night sky is brighter. 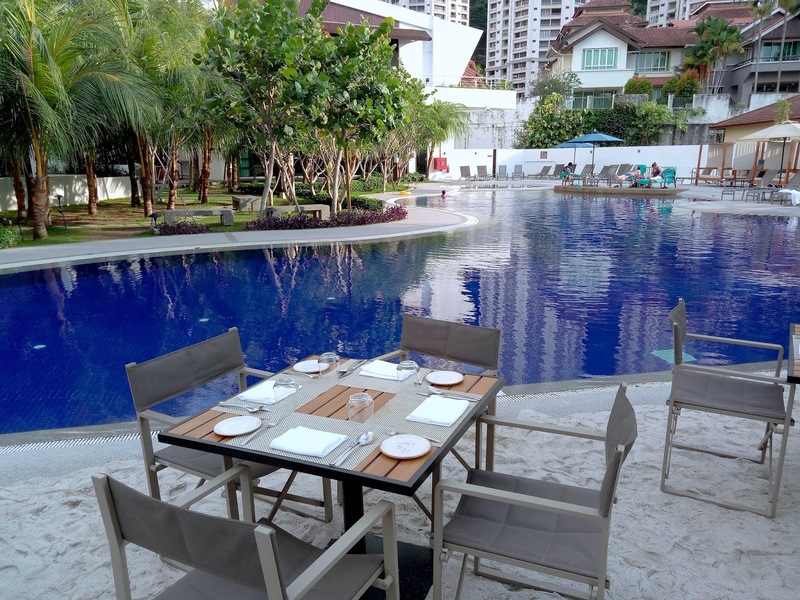 As the name implies, the Poolside BBQ Buffet is held next to the hotel's swimming pool. Dining tables are arranged on the pool's sandy "shore", giving diners the illusion of an actual beach. The scenery is quite mesmerizing after sunset. The al fresco setting also takes advantage of the cooling breeze from the sea. 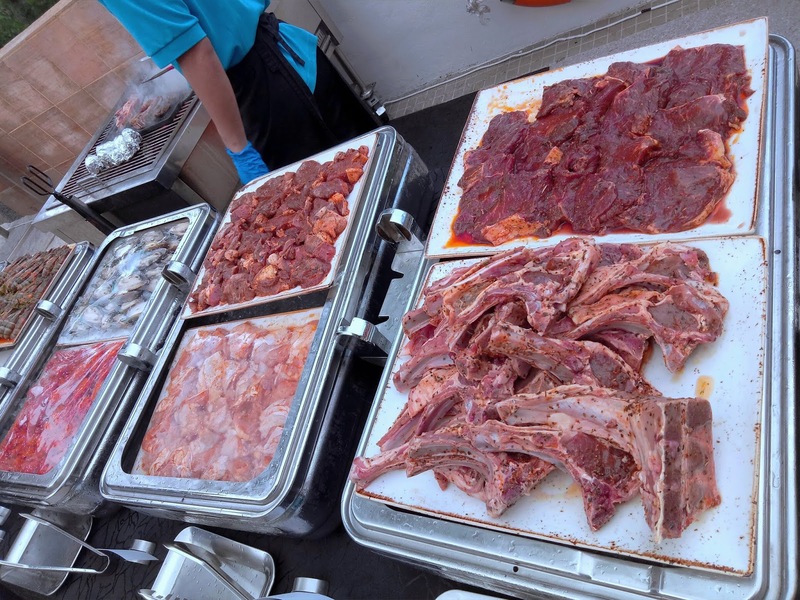 A charcoal-fired grilling station is where barbecued meats are prepared upon diners' request. 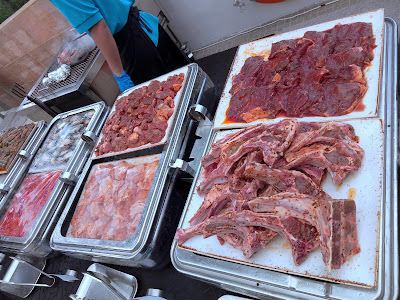 Popular meat choices are Paprika Beef Minute Steak, Cajun-Marinated Lamb Cutlets and Cinnamon Chicken Thigh. 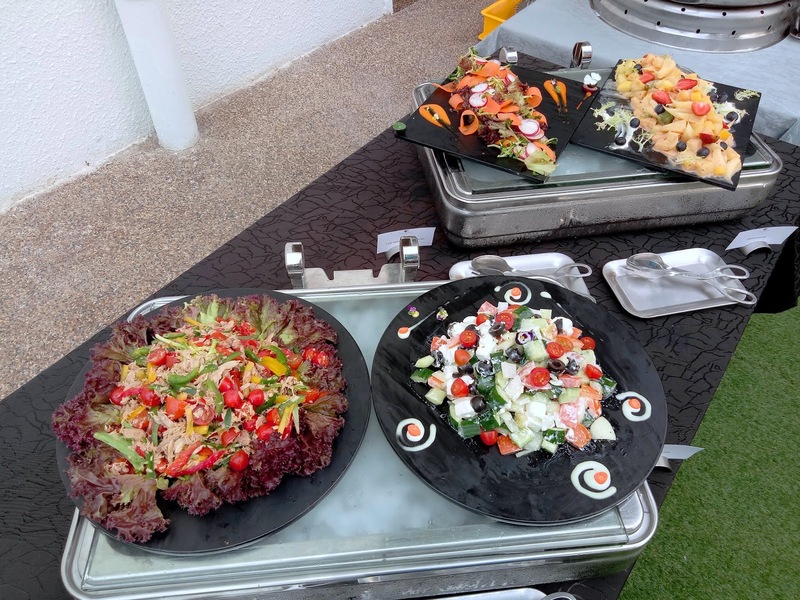 As for seafood, marine delicacies are Tom Yam Tiger Prawns, Tandoori-Marinated Squid, Citrus-Marinated Green Mussels and Hokkaido Scallops. The salad bar offers a handful of interesting dishes to complement barbecue. The salads this evening are Tuna Niçoise Salad, Feta Cheese Salad, Pea Sprouts Salad and Fruit Salad. 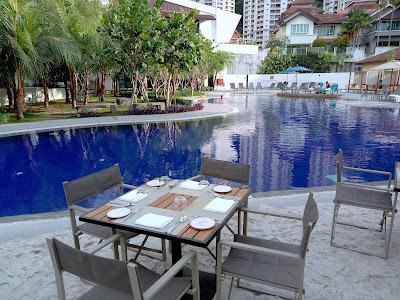 The Poolside BBQ Buffet is priced at RM99.00 net for adults. 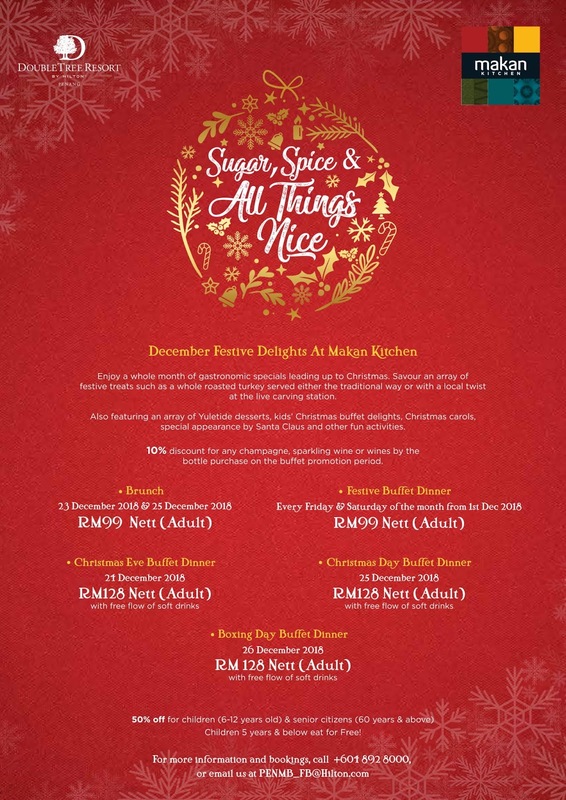 Children (aged 6 to 12) and senior citizens (above 60 years) enjoy half price. In addition, each child dines for free when he or she is accompanied by a paying adult. 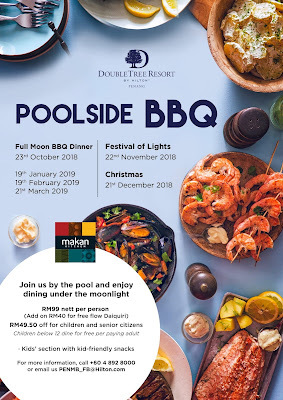 In preparation for the upcoming Christmas festival, DoubleTree Resort is proud to give a sneak peek of its yuletide-themed buffets. 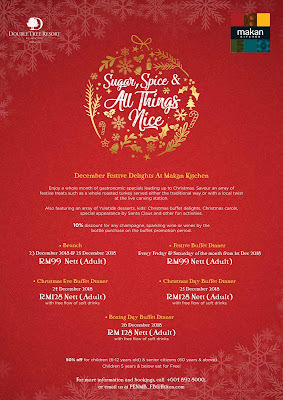 The festive menu is themed "Sugar, Spice & All Things Nice". Once again, children and senior citizens get 50% discount off the regular adult price. 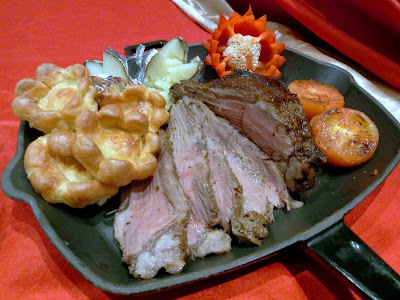 Starting at the carving station, the Roast Lamb is served with Yorkshire puddings, jacket potatoes and grilled tomatoes. As per tradition, the lamb also comes with mushroom and cranberry sauces. The actual menu includes Roast Turkey too. 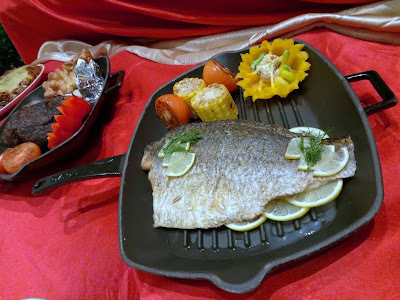 Another commendation dish is Baked Sea Bass. 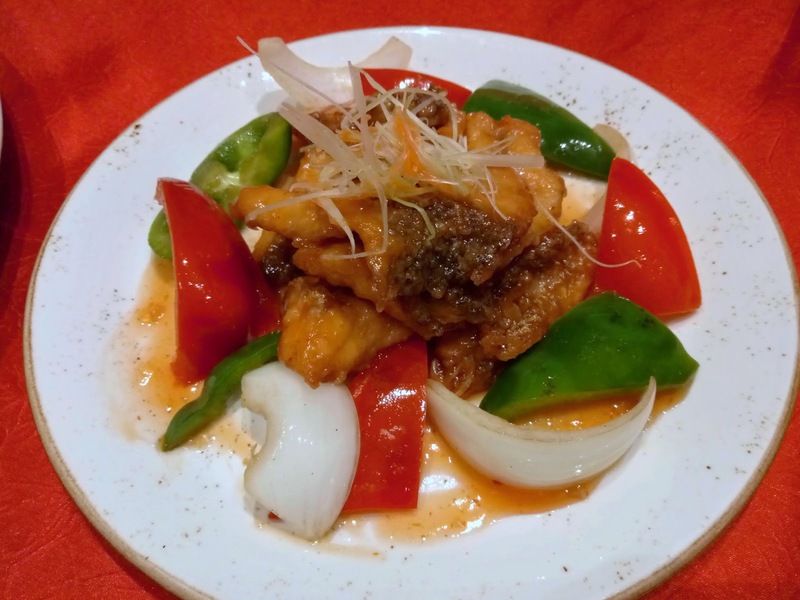 Although mild in flavor, the fish is truly succulent. Meanwhile, lemon slices serve to give the sea bass a touch of citrus tanginess. Seafood Chowder is available in two versions: cream- and tomato-based. 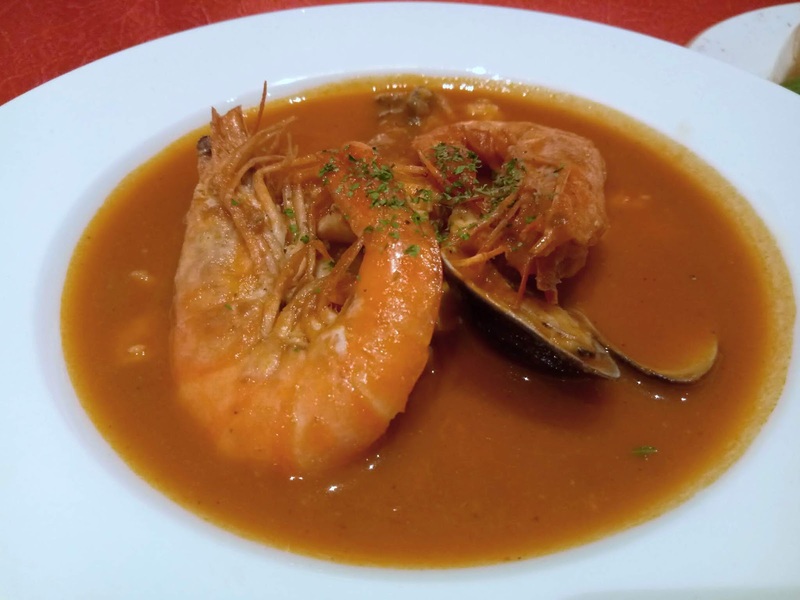 While both types are pleasant, I personally prefer the former as it preserves the delectable taste of shrimps and mussels. Sweet & Sour Fish is a popular Asian dish. Fish fillets are coated with batter, and then stir-fried with sweet-and-tangy sauce. Bell peppers and onions are added for the extra crunchiness. As for Seafood Fried Rice, I am delighted to see a generous amount of shrimps in it. Try to consume this dish while it is still hot from the wok. This is when the rice's aroma and taste are at the zenith. 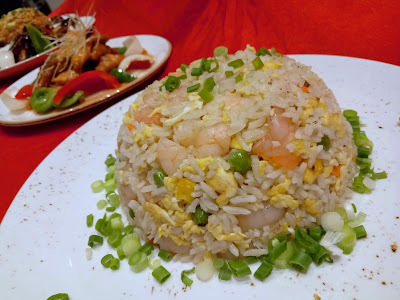 Despite is simplicity, the Seafood Fried Rice appeals to my palate. Hailing from the Middle East, the Eggplant Moussaka is another interesting dish indeed. 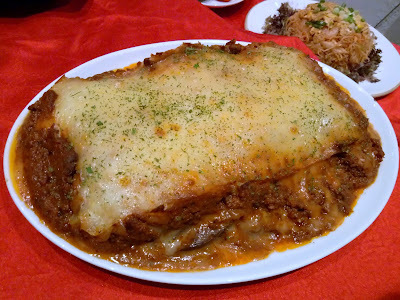 Similar to lasagna in appearance, Eggplant Moussaka is made from layers of eggplant and tomato-based meat sauce. A layer of cheese crust covers the top. Moving on to confections, Apple Strudel is prepared from a pastry jacket with sweet apple filling inside. It is also dusted with icing sugar for aesthetic appeal. 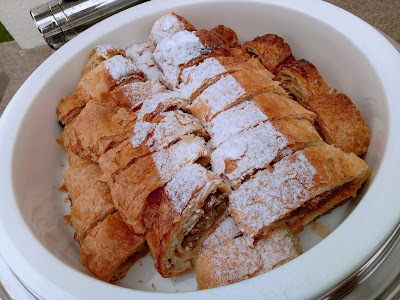 Other festive pastries during Christmas season are Stollen, Panettone, Christmas Cookies and Fruitcake. 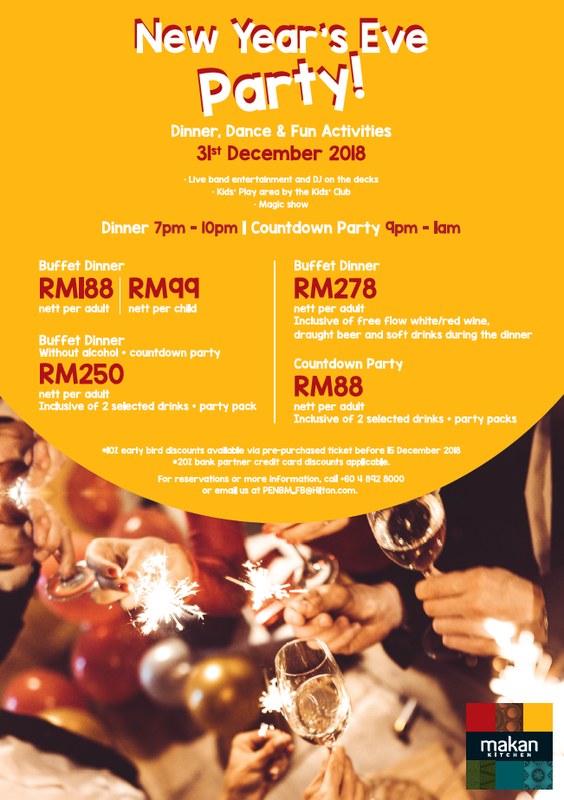 A week after Christmas, DoubleTree Resort is hosting a New Year's Eve Party on 31 December 2018. During the buffet dinner, the atmosphere is kept lively by a DJ and live band performance. There are also magic shows to keep children occupied. Early birds with confirmed bookings before 15 December 2018 enjoy 10% discount.